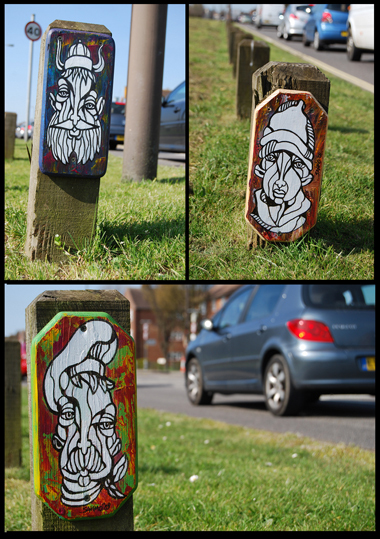 Fine art, Illustration, graphic design and the art philanthropy of Sam Morrison: The Art 2030 Project - Southsea, Portsmouth U.K.
My wooden plaques were recently installed for the 'Art 2030' - Eastern Road bollard art project in Southsea, Portsmouth, U.K. This guerrilla art project was conceptualized by "My Dog Sighs", who had this to say about the inspiration for the project: "So I drove home from work on this road ( the eastern road Portsmouth A2030) every day and it is always gnarled up. 10-15 mins everyday I sit stuck in traffic looking a a row of about 150 wooden bollards stood along the road. they must get tens of thousands of slow moving cars crawling past them everyday. the ultimate canvas!!!!"